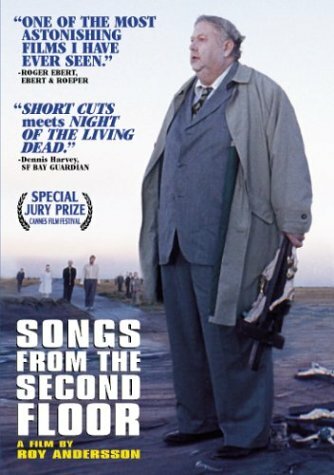 This movie was made in 2000 (Sweden) by Roy Andersson. The main actors in this movie were Lars Nordh, Stefan Larsson, Bengt C.W. Carlsson, Torbjörn Fahlström and Sten Andersson. It was a really boring and weird plot that I would rather not want to talk about, but I will. This movie starts with a man going to work and he gets fired. The man gets really emotional because he has already worked there for 30 years and starts crying which results in his boss walking away. This movie in my opinion was all about sadness because the next guy that they introduced to us was also a sad man, his store was burned (or maybe even burned it himself) and he was in need of insurance money. This movie was weird, bad, disturbing. It had many traffic jams that I didnt know what they were about, then it ended with the guy standing and some zombies going after him which was the weirdest part ever. It was a freaky movie. The genre must of been drama and from 1-10 I would give this movie a -3. I would definetly not advice this movie to any of my age group people because it was such a horrible movie.